Blue is generally considered a cool hue. Yellow will warm it. Warm colors have yellow undertones. Cool colors have blue undertones. 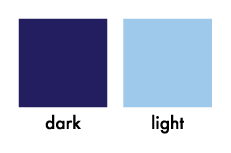 The dark blue above is quite close to black (low value). The addition of black to any color makes a "shaded" hue. 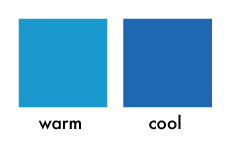 The light blue is closer to white (high value). The addition of white makes a "tinted" hue. The blue on the right is quite intense, with high saturation. Colors are softened ("toned") by introducing gray. The blue on the left has a much lower chroma. It's worth mentioning that none of these properties can be properly assessed without comparison. 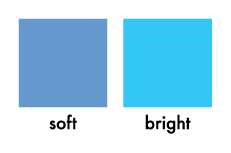 That first blue might be considered rather soft until you compare it to the fifth one, which might appear quite light until you compare it to the fourth one. You might imagine, then, why it's nearly impossible to know your best colors without an objective way to observe them. 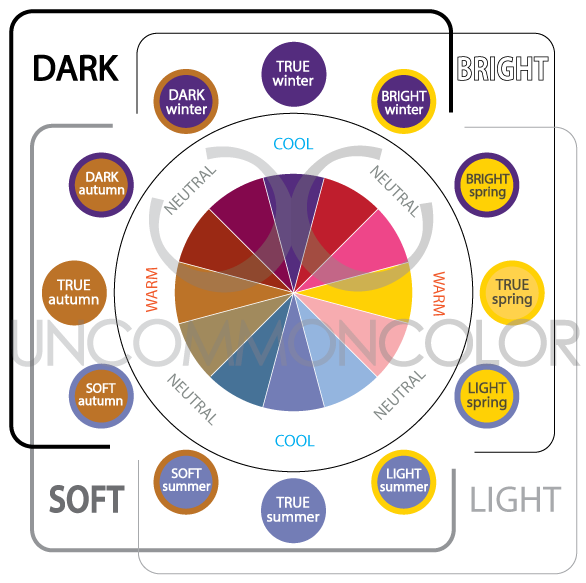 An analysis with Uncommon Color will seek and find the appropriate temperature, value, and chroma that support your appearance. mist of sea spray in the summertime. Winter and Autumn are dark. The earth tilts away from the sun and darkness steals the late afternoon until morning. Winter and Spring are bright. Brightness comes in the form of winter's sparkling snowflakes and spring's brilliant sunshine. Spring and Autumn are warm. Spring and Summer are light. Moving back toward the sun means plenty of light from morning till night. Summer and Autumn are soft. The greying sky before a summer storm and the dulling of leaves before the autumn fall. Winter + Spring = Bright Winter (CN) and Bright Spring (WN). Winter + Autumn = Dark Winter (CN) and Dark Autumn (WN). Summer + Spring = Light Summer (CN) and Light Spring (WN). Summer + Autumn = Soft Summer (CN) and Soft Autumn (WN). Interested in the visual expression of color theory and how it relates to your own coloring? I would love to show you.